During the month of may, a few KMS Art students created an extra painting inspired by Lei Day (May Day in Hawaii) and Memorial Day. The flowers also resemble the colorful radial patterns of fireworks, which is why I’m making this post in July. Happy Lei-Memorial-4th-of-July Days! The final project for Kapaa Middle School Art students this year was to fold and decorate a large portfolio to carry a year’s worth of Artwork home safely. With only a few school days left, I decided to squeeze one more foundational drawing lesson in and teach the kids 2-point perspective. 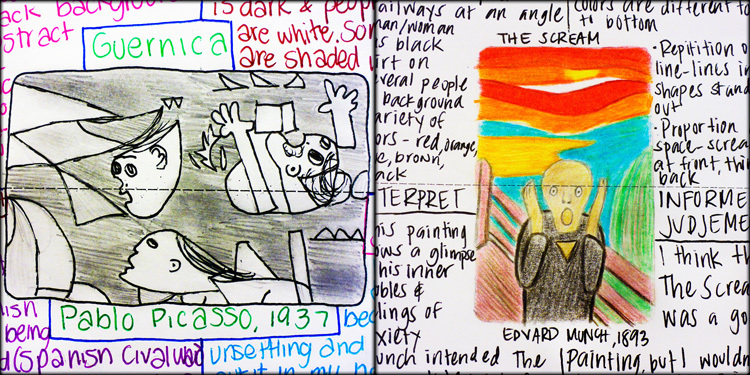 Students used rulers and pencils to map out two vanishing points set on a horizon line. Together we drew a small group of cubes to which we added roofs, doors, shingles, and other features. After sketching about 3 different house structures, we incorporated the tree and branches that support the treehouse. At this point students broke free from my step-by-step tutorials and added their own creative and unique details such as rope ladders, lanais, zip lines, hot tubs, and slides. 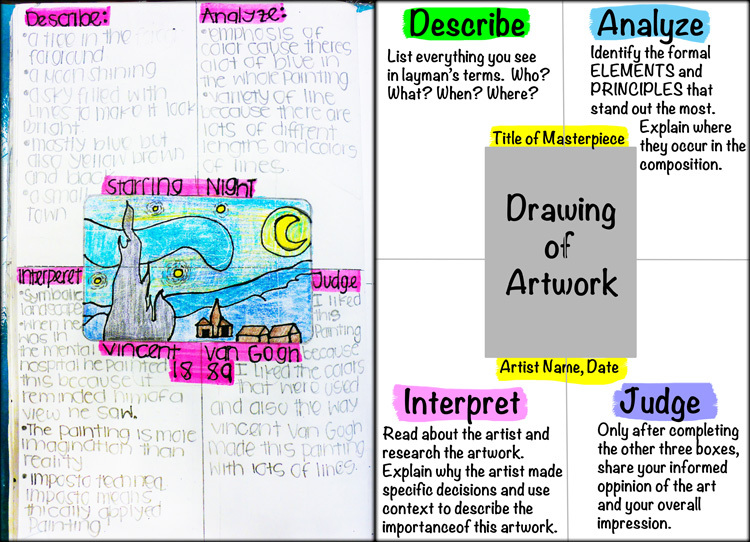 Due to the rushed nature of this last assignment, I don’t have many finished examples to share. Several students promised to finish what they started over the summer break. 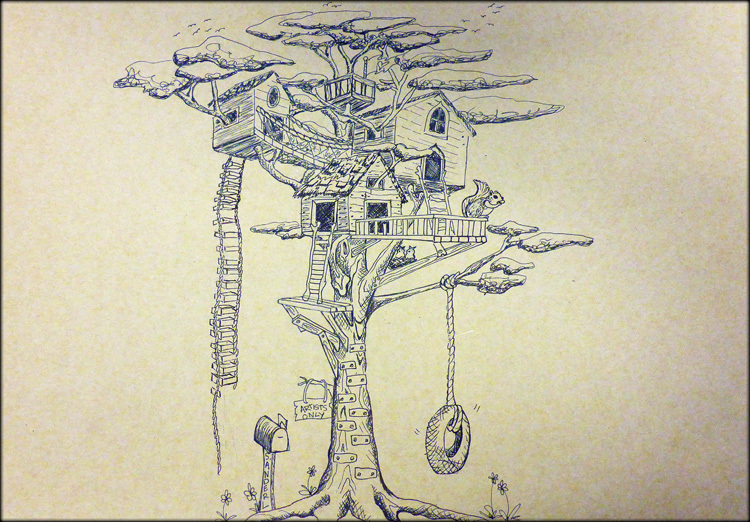 I hope they follow through on that promise because these tree houses are Treemendous! I was so thrilled when the 8th grade team invited me to lead a craft activity at the 8th grader’s annual Camp Sloggett excursion. Mr. Sanderl and I packed up our tent and prepared for 2 days of Koke’e camping with 120 middle schoolers! Check out Mr. Sanderl’s 2014 KMS KOKEE TRIP video on Vimeo for highlights. The craft I chose is one that I remember from my own summer camp days at Miracle Ranch in Gig Harbor, Washington. In fact, that was probably the last time I made knotted friendship bracelets! Breathing the fresh mountain air, sharing a fun craft from my childhood, and bonding with the kids made camping one of this year’s highlights. 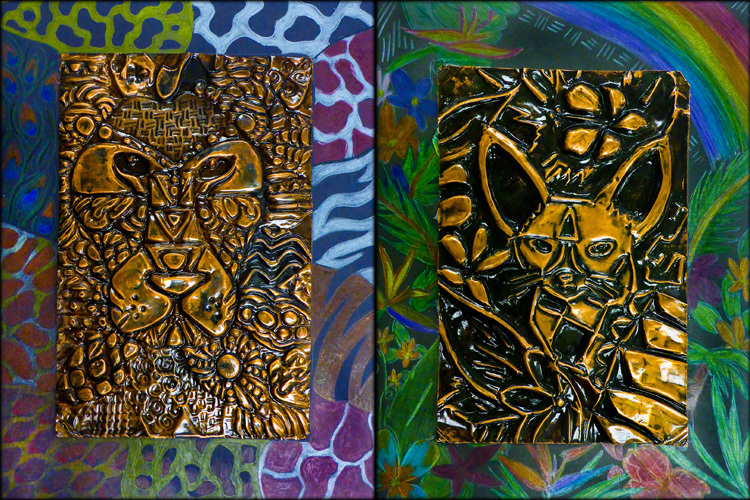 Kapa’a Middle School’s Art students finished their tiki sculptures with either a pure white or natural brown glaze. 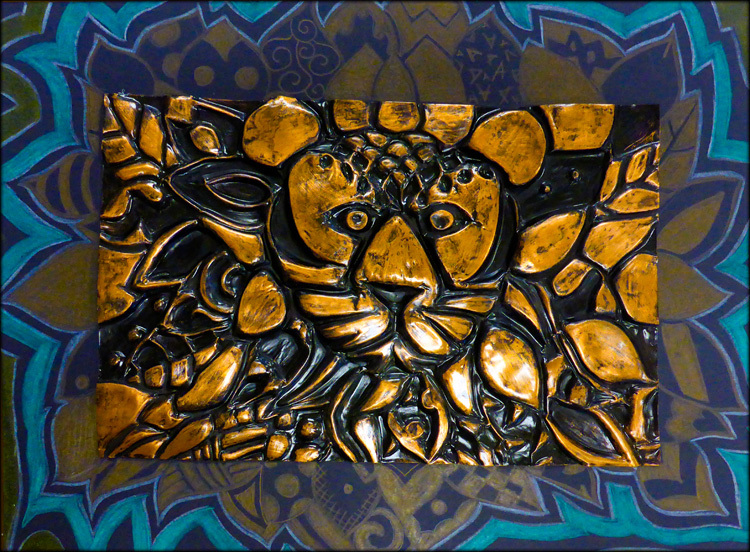 By limiting to one glaze color, the emphasis of this 3-dimensional work remains the carved textures, modeled form, and sculptural details. 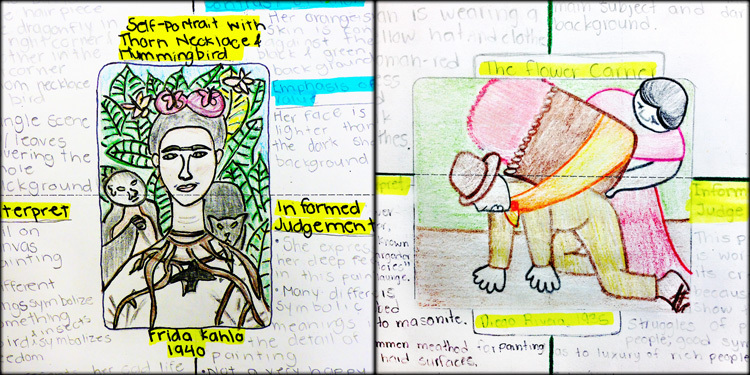 In addition to expressive tiki characteristics, some students chose to include added symbolism to represent a specific hawaiian tiki god or their own special meaning. 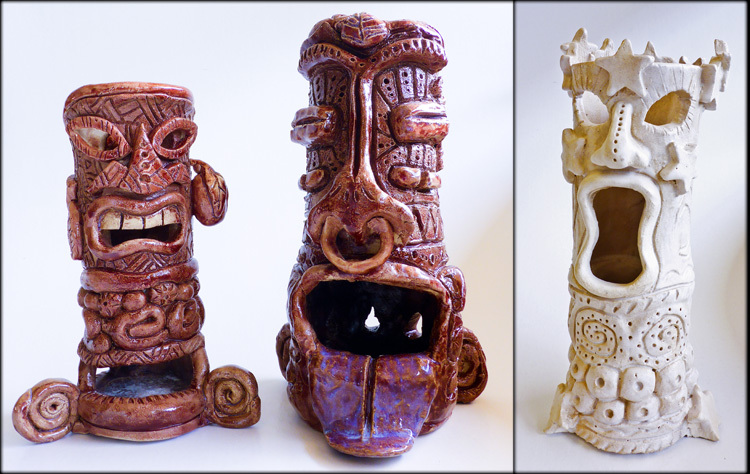 While mainly decorative, the tikis can also serve a variety of functions, from garden art, candle holders, incense burners, or creative containers to hold knick-knacks. Melted colorful class at the base adds a colorful surprise when you look inside! The sculptures pictured here are only a few samples to represent a range of students from 6th, 7th, and 8th graders selected from all of my classes. 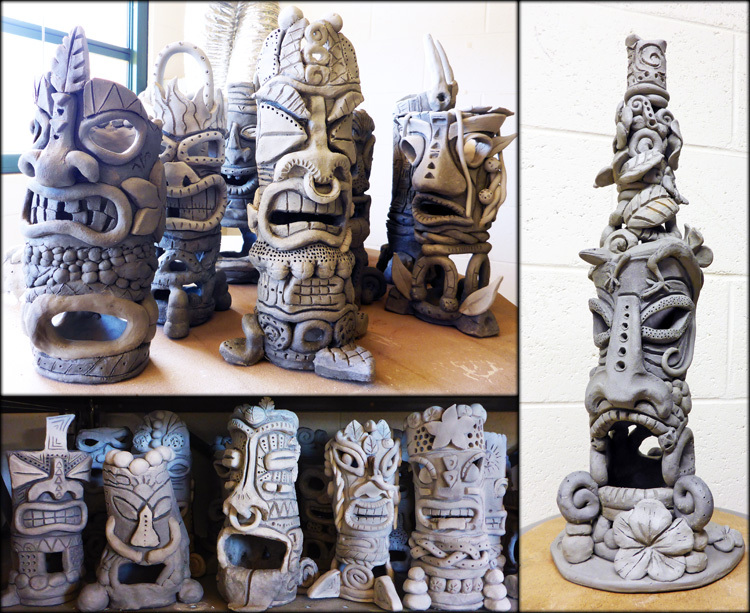 In all there are 170 tikis that required a total of 500 lbs of clay, 5 gallons of liquid glaze, a number of kiln loads, and 4 months to complete! “Collaborating for a Cause” was at the heart of this project that involved collecting plastic and waste from local beaches and making a statement about the environment. After several beach clean-ups and discussions about our message, students got creative inventing ways to make socio-political recycled works of Art. The title of this artwork references the power and source of the famous “Delorean” from the movie Back to the Future. This iconic car travels through time completely powered by feeding trash into its flux capacitor. Flux is the action of flowing in or flowing out, and capacity is the maximum amount that something can contain. 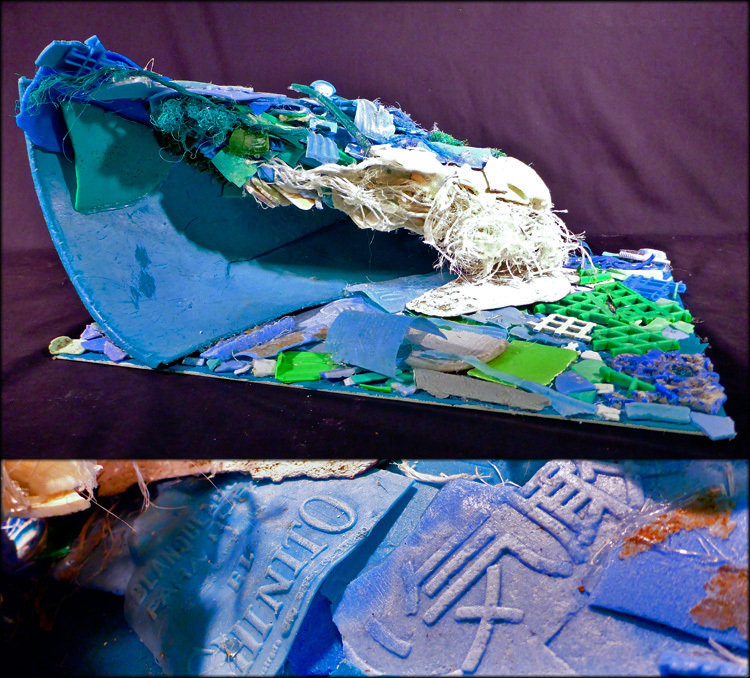 The artwork titled “Flux Capacity” displays an incredibly powerful, beautiful, and dynamic force of nature that is infected with non-biodegradable plastics that are currently plaguing our oceans, beaches, and marine life. This is a call to all surfers, swimmers, and beach-lovers to join in an effort to clean our waves and water! This artwork seduces you with its beautiful colors and painterly design. 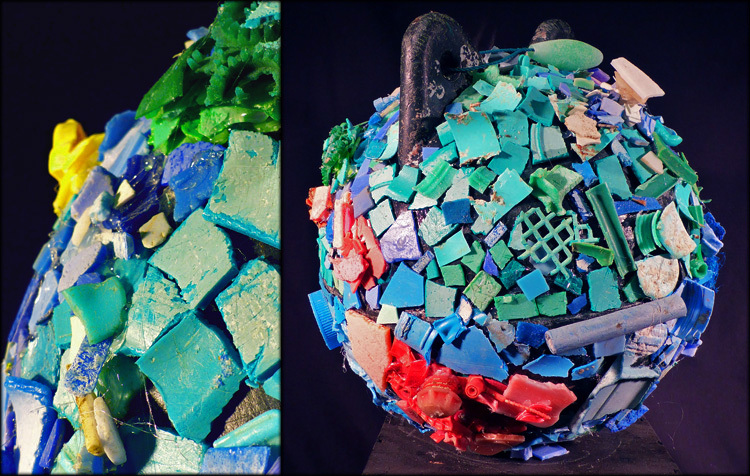 Once it draws you in closer, it may come as a surprise that parts of it are made from colorful plastics collected from our local beaches. Sometimes it takes a different viewpoint or creative eye to find something that we normally think of as ugly trash, and turn it into beautiful artwork. As you allow this work to sink in, you may begin to uncover the layers of meaning that are captured here. As you read the message in this artwork, who do you see? 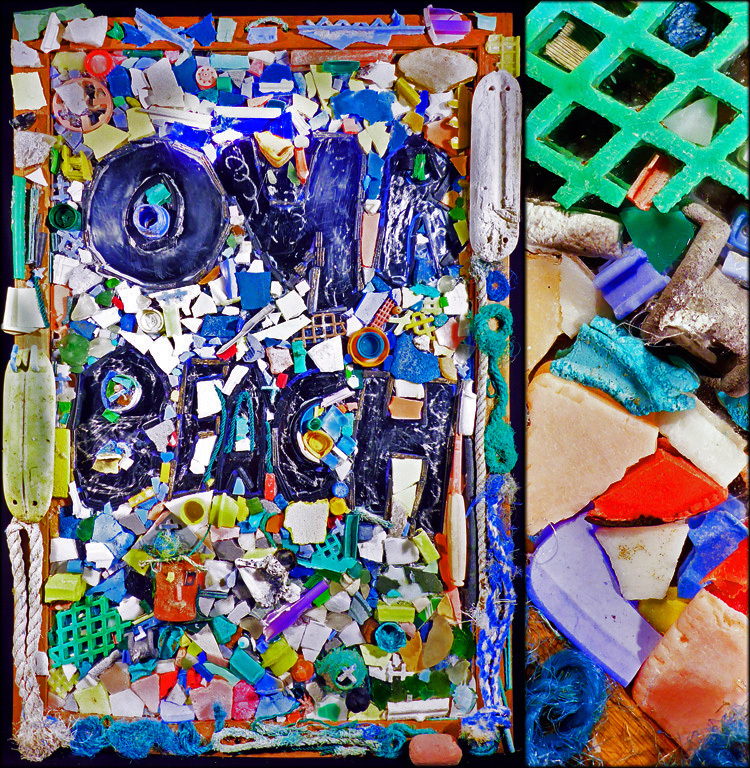 Plastics and trash were adhered onto a mirror surface so as you read the words “Our Beach,” you also see yourself. The reflection might evoke feelings of personal responsibility because we all play a part in overconsumption. We can also all be part of the solution! 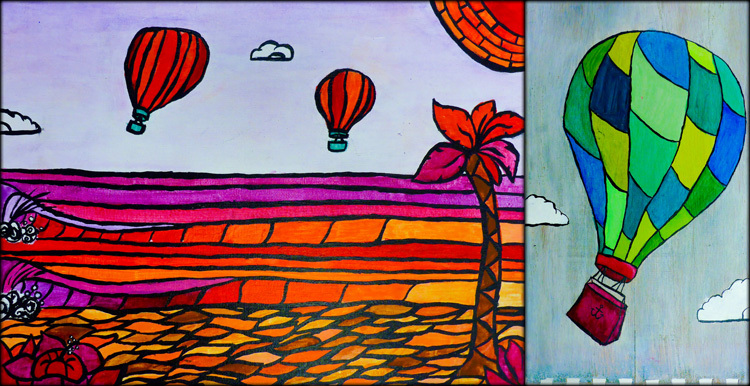 When students came up with the message they wanted to communicate through this artwork, they initially said “Your Beach. My Beach. Our Beach… Make a Difference.” The final artwork was streamlined to impact viewers with a simple and meaningful idea that connects us all. This group of artists formed their composition on a large plastic buoy that was found littering one of our local beaches. 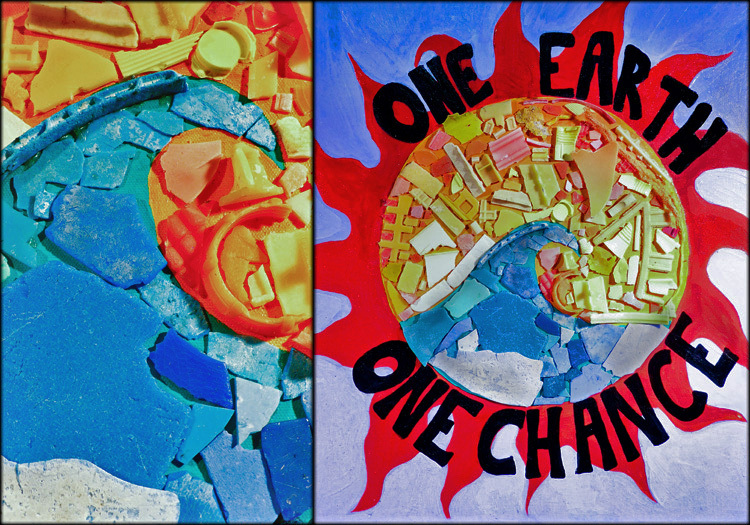 The mosaic of colorful found-plastics looks beautiful, yet also implicates the threat our Earth faces. Look closer and you may also notice some familiar island forms whose symbolic colors stand out against the blue-green seas. The same threats that face us globally, also ensure imminent local impact. Let’s make a positive difference! 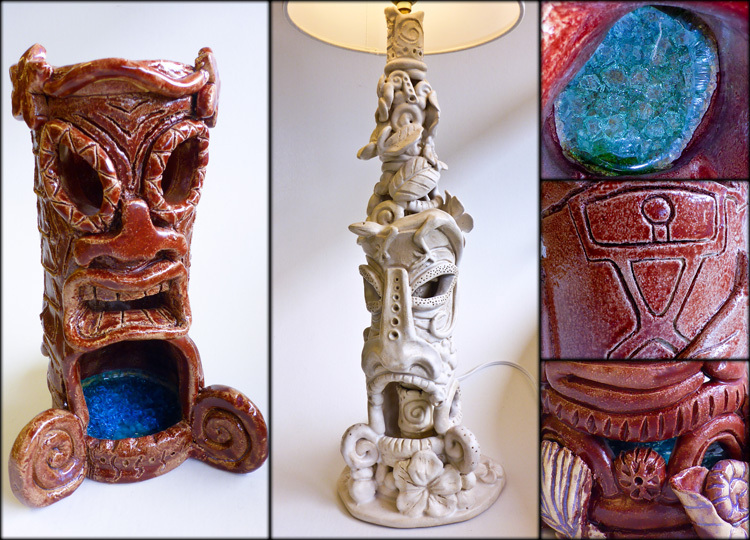 During second quarter Kapa’a Middle School Art students created a ceramic sculpture with a Hawaiian tiki theme. Along with clay hand-building techniques such as coil and slab building, students also explored the history and symbolism of tikis. 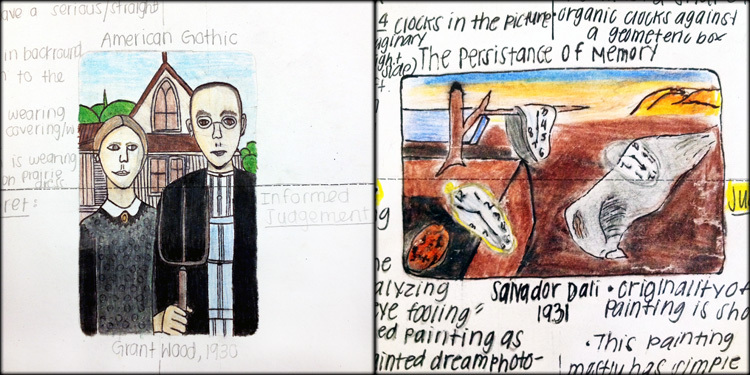 These modern tikis represent students’ unique interpretation of an ancient cultural practice. 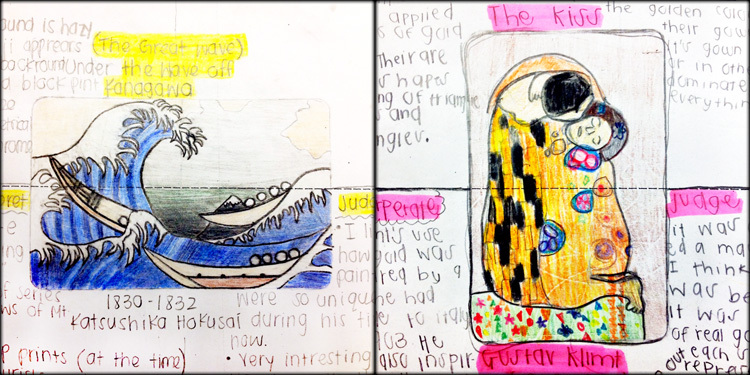 While some students chose to include symbolism representing one of the four ancient tiki gods Lono, Kanaloa, Ku or Kane, others chose to invent their own tiki god. This week I’m loading up the kilns to prepare for bisque firing. When students return from Winter Break they will finish by glazing their sculptures. Stay tuned for the final Artworks! 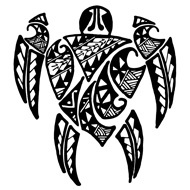 It was a long and grueling process that involved portfolios demonstrating my teaching style and curriculum, video submissions of my classroom teaching, photographs of student work, and even a trip to Oahu for a content-based examination. I certainly can’t say that it was fun, but it was the most relevant professional development I have encountered in my post-graduate work. I have to give a special thanks to my husband, Christopher Sanderl, for all of his love and support throughout this process. If there are any teachers out there who are interested, I’m happy to share my experience and advice!